Postage rates for International Mail have been going up rapidly through the years and will soon go up again. At this point, we can mail a pair of rods to Canada & Mexico for $8 US, and to most of the rest of the world for $12. You’ll see these options when you check out. If it ends up costing more, we will let you know before we ship. We will inform you and adjust prices as necessary for orders of more than one pair of dowsing rods. 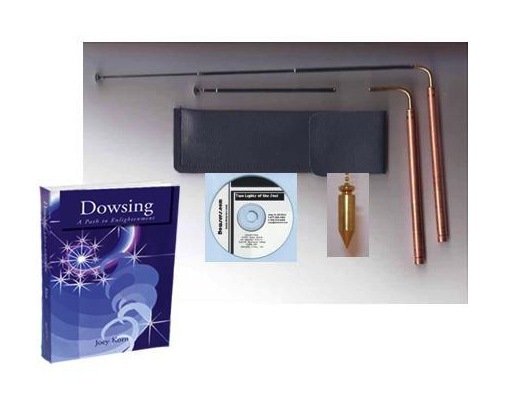 We offer quantity discounts on dowsing rods. Shipping Price will have to adjusted, up or down, for multiple pairs of rods. You can save up to 50%. You’ll see discounts when you order. We offer quantity discounts on dowsing rods. You can save up to 40%. You’ll see discounts when you order. We also carry complete dowsing kits, which include my book, a CD about my work, a pendulum and a pair of Bob Slack L-rods. You save $5 when you buy a kit. Click here to learn more, or click on the image above.